Sometimes a good idea takes some tinkering. You have a thought that it will work, but what it really requires is you take some money and time and test it out in a small form. This principle is sound if you’re trying to do home renovation (a paint splash on a wall can let you see if the color will work) and it is especially true if you’re planning a multi-million dollar mission to another planet. This is the thought behind the NASA Innovative Advanced Concepts office, which announced a dozen far-flung drawing-board proposals that received $100,000 in Phase 1 funding for the next 9-12 months. There are vehicles to explore the soupy moon of Titan, a design to snag a tumbling asteroid, and other ideas to explore the solar system. (But be patient: These testbed ideas would take decades to come to fruition, if they are even accepted for further study and funding.) Check out a full list of the concepts below. Titan Aerial Daughtercraft: A small rotorcraft that can touch down from a balloon or lander, with the idea being that it can jump between several spots to do close-up views. It would then bring its samples back to the “mothership” and possibly recharge there as well. “The autonomy needed for this concept is also applicable to exciting rotorcraft mission concepts for Mars and to in-situ exploration of Enceladus,” the description stated, referring to an icy moon of Saturn. Comet Hitchhiker: This would be a “tethered” spacecraft that swings from comet to comet to explore icy bodies in the solar system. “First, the spacecraft harpoons a target as it makes a close flyby in order to attach a tether to the target. Then, as the target moves away, it reels out the tether while applying regenerative brake to give itself a moderate (<5g) acceleration as well as to harvest energy,” the description stated. 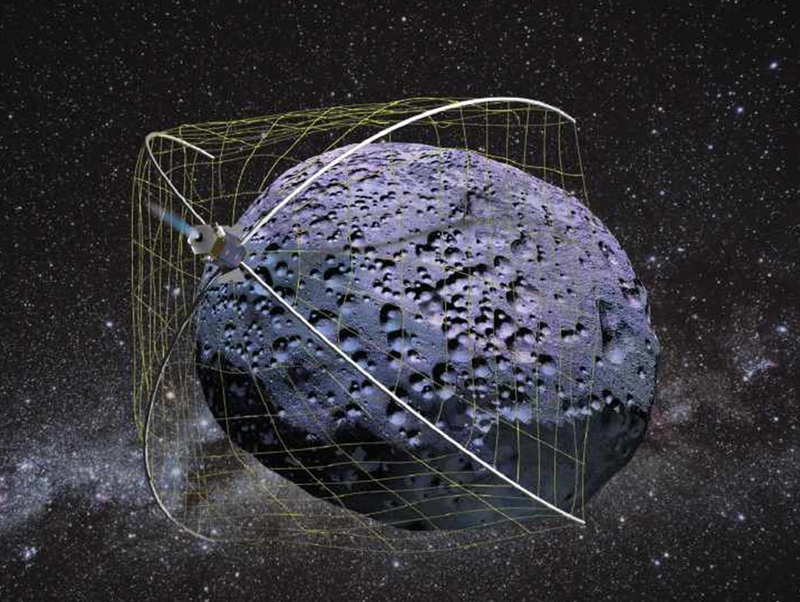 Weightless Rendezvous And Net Grapple to Limit Excess Rotation (WRANGLER): This idea would capture space debris and small asteroids. It will use a small nanosatellite equipped with a “net capture device” and a winch. “The leverage offered by using a tether to extract angular momentum from a rotating space object enables a very small nanosatellite system to de-spin a very massive asteroid or large spacecraft,” the description stated. Mars Ecopoiesis Test Bed: A machine that would test how well bacteria from Earth could survive on Mars, which could be a precursor to “terraforming” the planet to make it more like our own. Researchers would select “pioneer organisms” and put them into a device that would embed itself into the Martian regolith (soil) in an area that would have liquid water. It would “completely seal itself to avoid planetary contamination, release carefully selected earth organisms (extremophiles like certain cyanobacteria), sense the presence or absence of a metabolic product (like O2), and report to a Mars-orbiting relay satellite,” the description states. ChipSats: Instead of having an orbiter and a lander in separate missions, why not put them in one? While there have been combinations before (e.g. 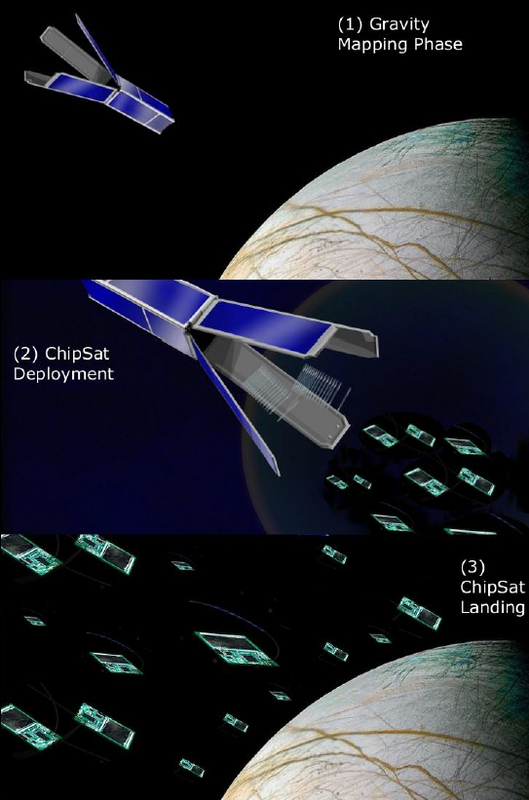 Cassini/Huygens), this is a bit different: This concept would have a set of tiny sensor chips (ChipSats) that deploy from a larger mothership to make a landing on a distant planet or moon. Swarm Flyby Gravimetry: While whizzing by a comet or asteroid, a single spacecraft would release a swarm of tiny probes. “By tracking those probes, we can estimate the asteroid’s gravity field and infer its underlying composition and structure,” the description stated. Probing icy worlds concept: How thick is the ice on Jupiter’s Europa or Ganymede, or Saturn’s Enceladus? Open question, and makes it hard to predict how tough of a drill one would need to probe the ice — or how well life could survive. This concept would send a probe to one of these locations and receive “a naturally occurring signal generated by interactions of deep penetrating cosmic ray neutrinos” to better get a sense of the depth. This could allow for maps of the ice. Heliopause Electrostatic Rapid Transit System (HERTS): This would be a mission that goes deep into the solar-system and out to the heliopause, the spot where the sun’s sphere of influence gives way to the interstellar medium. Using no propellant, the spacecraft would use solar wind protons to bring it out into the solar system. “The propulsion system consists of an array of electrically biased wires that extend outward 10 to 30 km [6.2 miles to 18.6 miles] from a rotating spacecraft,” the researchers stated. PERIapsis Subsurface Cave OPtical Explorer (PERISCOPE): A way to probe caves on the moon from orbit. Using a concept called “photon time-of-flight imaging”, the researchers say they would be able to bounce the signal off of the walls of the canyon to peer into the crevice and see what is there. Submarine, (300 km) of depth. On Earth the submarine gets crushed at 11 km depth. Can I assume that the low mass of the moon makes it possible to go that deep? It’s obviously a typo because it says “984 feet (300 km) of depth,” 984 feet equating to 300m… Not km. If understand this correctly, they take the solar wind, and use cosmic rays to turn the hydrogen onto oxygen as a big atom smasher? A little simpler: they use far UV light to turn CO2 into O2 + C (s) most likely. But they have to carry the CO2. Of course humans produce CO2, but they still need to bring enough C and O. Well, enough O2. They would never bother bringing CO2, people will produce that when they breath, it is just a matter of reclaiming it. I believe Elizabeth meant 300 Meters as the conversion from 984 feet in depth. I put this project at the top of the list! I like the Titan balloon idea but as I keep trying to relate to people–I think this balloon would do better in the Jovian or Saturnian atmospheres—that’s where the life will be found. How does Carbo nanotubes behave in space? I can imagine if you have carbon extraction technology from the CO2, then use that C to make Carbon nano tubes. Build material out of this nanotubes using a 3D printer. That would make be really helpful. I am just spouting new ideas. Near the inner planets we have an abundance of solar energy. Attitude control can be done using reaction wheels. But to alter the speed we need some particles that can be accelerated. Could the solar wind provide the fuel that could be used in an ion drive? What was unmentioned is that Saturn’s moon Titan has liquid Methane oceans, Methane clouds and frozen Methane polar caps. Titan never gets above -100F and never had a dinosaur or a fern. Methane, as are all natural Hydrocarbons, are produced with Hydrogen and Carbon gases are forced into molecules by heat and pressure and exist throughout the Universe. On Earth, elemental fission produced atoms, combined with vaporized by fission heat atoms combine to form the full series of petroleum products. See “Fracturing the Fossil Fuel Fable” at the FSS site, and dismiss the 1950’s Hubbert “Peak” Oil hypothesis. BTW….CO2 does not capture, store, redirect of amplify electromagnetic energy. Carbon climate forcing is a fraud, as is ‘sustainable’ energy which uses more energy to create than it can ever produce. Try the Titan balloon and daughtercraft on Venus. It would be hard to make something that lived constantly at Venusian surface temperatures, but you might be able to land and hop off again. Use the rings of Saturn as an Aragoscope from high polar orbit. Next PostNext Weekly Space Hangout – June 6, 2014: Comets & Cosmos?